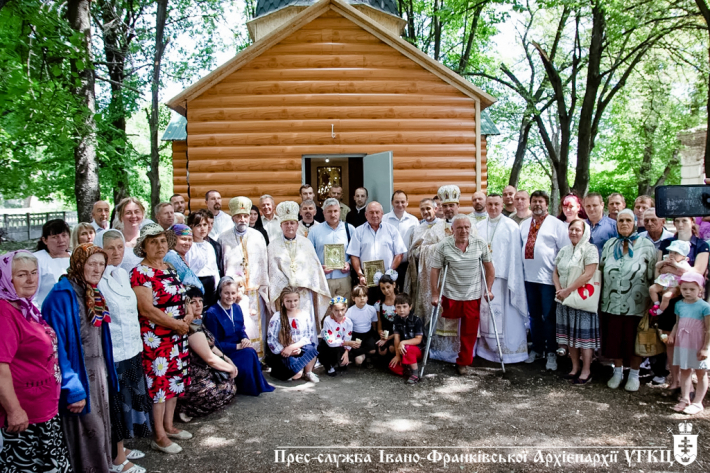 June 14, 2018 In a frontline city Volnovaha was held an opening ceremony and consecration of a new church of Annunciation of the Blessed Virgin Mary. The church was built by joint efforts of faithful from Ivano-Frankivsk archeparchy. Following an enactment released by Metropolitan Volodymyr Viytyshyn, who, before the opening ceremony blessed church belongings and a festive Divine Liturgy was celebrated by syncellus of social service of Ivano-Frankivsk archeparchy and Head of Karitas “Ivano-Frankivsk” metropolitan Volodymyr Chorniy. In co-service with numerous priests who serve on the east of Ukraine, Fr. Volodymyr sanctified a temple and and celebrated a Divine Liturgy there. “We are happy to unite with all in this way, who, virtually, are staying at the frontline. May this temple be a sign of support and unity of Subcarpathia with eastern borders of Motherland. May prayer for our militaries and peace sounds here constantly”, Fr. Volodymyr addressed to the present ones. Bishop Volodymyr is being grateful to donators, who made this God’s plan of constructing a new church for victims of war be turned into reality. Among the donators are: Fr. Ivan Lypka (Madrid, Spain) and his parishioners, Mr. Ruslan Martsinkiv, Fr. Roman Pelio (Udine, Italy), Fr. Serhiy Znak (Barselona, Spain), Fr. Vitaliy Mykytyn (Salzburg, Austria) and everyone who contributed in their own way.